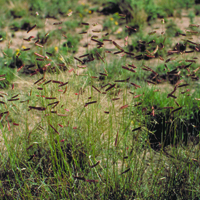 This native grass is found throughout the arid and semi-arid areas of West Texas and into California. Extremely tolerant of drought conditions in challenging soil types, and thrives on as little as 7 inches of rainfall per year. Typically growing up to 2 ft tall, this important western grass species historically served as a primary source of forage and cover for wildlife over an extensive range.